IELTS Exam Preparation - Grammar Exercise #2: Past Simple or Present Perfect Simple? Grammar Exercise #2: Past Simple or Present Perfect Simple? 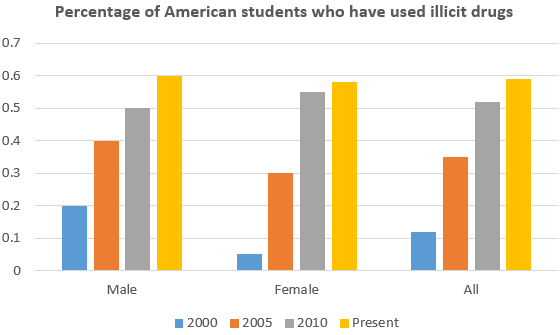 1) The chart shows the percentage of American students who ............. (use) illicit drugs since 2000. 2) The proportion of female students who have ever used illicit drugs ............. (increase) by more than 50% since 2000. 3) In 2010, the percentage of American male students reported to be using drugs ............. (rise) to 50%. 4) From the graph we can see that illicit drug use among American female students ............. (rise) each year. 5) The percentage of male students who used illicit drugs ............. (be) greater than the percentage of female students from 2000 to 2010. 6) However, American female students ............. (overtake) male students in drug usage since 2010. 7) The overall drug-use rate among American students ............. (grow) each year and the most significant rise ............. (occure) between 2000 and 2005.